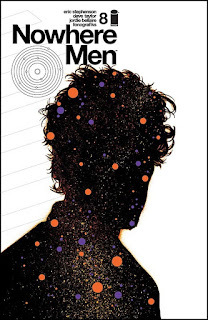 The second story arc of the bestselling NOWHERE MEN by writer and Publisher at Image Comics, Eric Stephenson, new series artist Dave Taylor, Eisner-award winning colorist Jordie Bellaire, and Fonografiks is flying off the shelves. In order to keep up with customer demand, NOWHERE MEN #8 is being rushed to a second printing. In NOWHERE MEN #8, the survivors of the World Corp space station disaster struggle to come to grips with their respective transformations. NOWHERE MEN #8 remains available for purchase across all digital platforms, including the Image Comics website (imagecomics.com), the official Image Comics iOS app, Comixology’s website (comixology.com), iOS, Android, and Google Play. NOWHERE MEN #8, 2nd printing (Diamond Code MAR168775) will arrive in stores on Wednesday, May 25, 2016. The Final Order Cutoff deadline for retailers is Monday, May 2, 2016. NOWHERE MEN #9 (Diamond Code JAN160601) is available now. NOWHERE MEN #10 (Diamond Code FEB160593) will arrive in stores on Wednesday, May 25. The Final Order Cutoff deadline for retailers is Monday, May 2. Dark Horse Comics Announces "Conan the Slayer"
Review: Halle Berry Stellar in "Frankie & Alice"